AMERICAN cops have released harrowing photos of a couple passed out in their car with a child in the back to show the devastating effects of heroin addiction. Ohio cops posted the pictures on Facebook after the pair were pulled over when the man, James Acord, was spotted driving erratically. They wrote: “We feel it necessary to show the other side of this horrible drug. 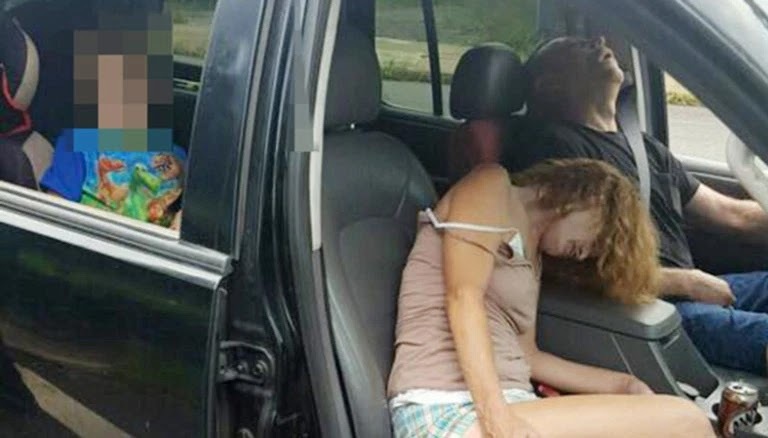 CNN reports he told police he was driving to the hospital, as the woman in the passenger seat, Rhonda Pasek, had passed out. Officer Kevin Thompson then saw Acord’s head “bobbing back and forth”, while his speech was “almost unintelligible”. Acord soon lost consciousness himself – and Officer Kevin Thompson noticed the little boy, Pasek’s 4-year-old son, in the back of the car. Both adults survived the overdose – with emergency services being forced to administered Narcan, an opiate antidote, to Pasek, who was turning blue. According to court documents, Acord pleaded guilty to operating a vehicle while impaired and endangering a child, while Pasek pleaded not guilty to endangering a child, disorderly conduct and public intoxication. The child was taken to social services. 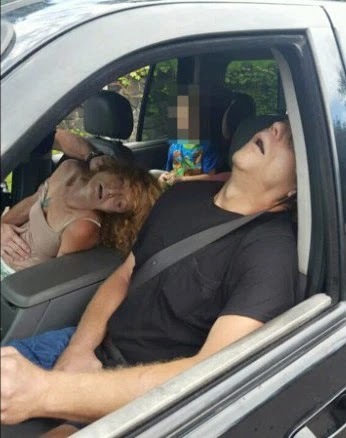 The police department said: “We are well aware that some may be offended by these images and for that we are truly sorry, but it is time that the non drug using public sees what we are now dealing with on a daily basis.